After a spiritual fix at my local Sunday service, it was time to get my other and more devilishly gluttonous fix for the day. I hopped the N train to 30th Ave in Queens, New York my destination was no other than controversially reviewed Petey’s Burgers. I exited the crowded train and crossed the street and entered the conveniently located In-Out Burger inspired burger spot, the menu was simple and affordable with tasty burger combo’s and creamy flavored shakes served counter style by a friendly knowledgeable staff. I ordered the Cheeseburger combo priced at $7.79 and an extra Cajun fire burger for a chaser, I glanced around at noticed happy locals gorging themselves while watching the previews of the NFL playoff games, no doubt hoping to line those stomachs for a heavy day of football related drinking and spectatorship. GO JETS!! My burgers were friendly delivered to my table by one of the owners of Petey’s, Peter Karalekas. We sat and chatted about his history and un-relentless vision for his burger empire, he lamented about his days in California and was passionately drawn to create a neighborhood burger restaurant for his native New Yorkers. I sat amazed at the bountiful bed of crispy hand cut French fries before me, flanked by a paper wrapped cheeseburger that was oozing gorgeous American cheddar and Petey’s special sauce, and a spicy Cajun Fire burger creation, both of which were making my mouth water with desire and greed. 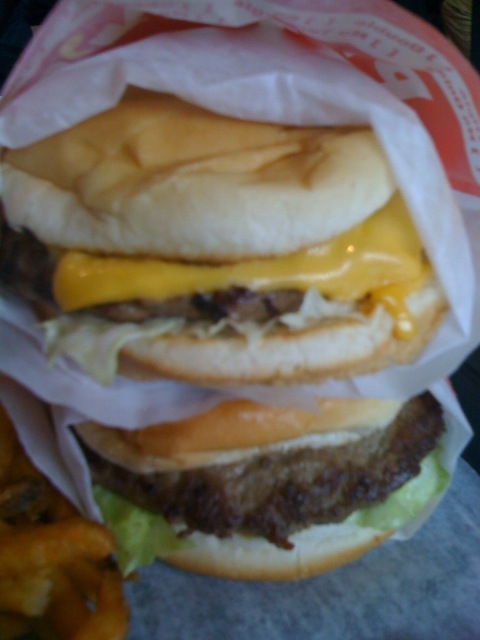 While on my quest for the best burger, in my opinion, there are several different types of burgers. There are your haute-couture type burgers, bistro burgers, alternative gourmet burgers, home-style diner burgers and your fast-food smashed burgers. If you go to Petey’s expecting anything else other than the latter, you’ll be disappointed. Petey’s is an excellent smashed style burger with a hellishly good taste and flavor that will have you wanting more. Despite the sometimes-controversial comparison to In and Out burger, I found Petey’s beef to be the superior quality that is grounded and supplied by La Frieda’s Butchery -a renowned favorite of Shake Shack and Spotted Pig burger architects. For all you In and Out fans instead of going West, try going East over the river you won’t be disappointed! If you want to find the most unique/best burger then travel North of NYC to Saratoga Springs NY. The Grey Gelding Bistro & Bar has by far the most twisted burgers to be found. 8oz or 12oz Kobe burgers with a variety of sauces: Royal Sonesta(andouille sauasage & creole sauce w/ melted monteray on House chibatta),Kip Deville(spicy apricot BBQ & Red Onions), Evening Attire(maytag blue/cream sauce), Machu Pichu(Aji Amarillo sauce), Capetown(pepperdew pepper & blue cheese-Piri Piri sauce), GG Burger(house guacomole,red onions,cheddar)and on and on! Please help make February 7 the “International Day in Memory of SSRI Fatalities”.